George has been enjoying the nice weather. He's too big to fit in the windowsill. Other than lounging he has been busy getting into my yarn. He had left a trail of cashmere all through the house. I've been getting ready for the photo shoot tomorrow. This was a very short design cycle and I am still waiting for two boxes. They are supposed to arrive today...fingers crossed. The lessons are starting to arrive. I reviewed three yesterday. I have blog entries for everything in the lessons. You might want to check them before starting to knit. The tip this week was a special request. When you are weaving in ends into a project which won't be seamed, you have to figure out how to work them in so that they will not be noticeable. (If you have seams or an edge where stitches are picked up, bury the ends there.) Scarves, blankets, shawls and swatches for courses or the Masters Program are the type of projects where this is a concern. I've already done an entry on weaving in yarn tails at the Cast On or Bind Off edge but if you are adding a new skein or changing colors, this can be a problem. The rules for weaving in yarn tails is that they don't show through to the RS, they stretch with the fabric and they don't pull free. This photograph shows several ends. There is a color change in ribbing and in the stockinette. What you do not want to do is to just run the tail up the selvedge stitch. It can pull free and it isn't elastic. Weaving in ends in ribbing is easy. I've done a blog entry on this topic as well. Weaving in Ends in Ribbing. 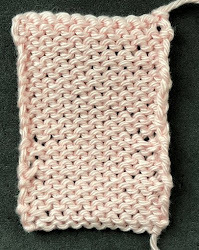 If there is stockinette stitch, use the duplicate stitch method. Here is the RS of the work. The tails do not show through to the RS even where the yarn is a different color. Here is the video showing the technique. Weaving in Yarn Tails. Salon will be on Sunday from 2-4pm. Tomorrow morning we are having the photo shoot. I'm hoping I can still get to the Met's Simulcast of Eugene Onegin. I finished up the infinity scarf for Mira at Baah yarns. I really like how it turned out. I also finished the Buff for Elff at Redfish. It is double knit. I spent a day last week charting a design for the Fall issue. I haven't done a stranded sweater with Redfish for awhile.